I can easily describe this book with one simple word… stunning. But even that one word does not completely do justice to this haunting and beautiful prose that plunges headlong into the deepest hurt of the physical and emotional. It is truly a book that will stay with you long after you’ve read the last page of the last story. 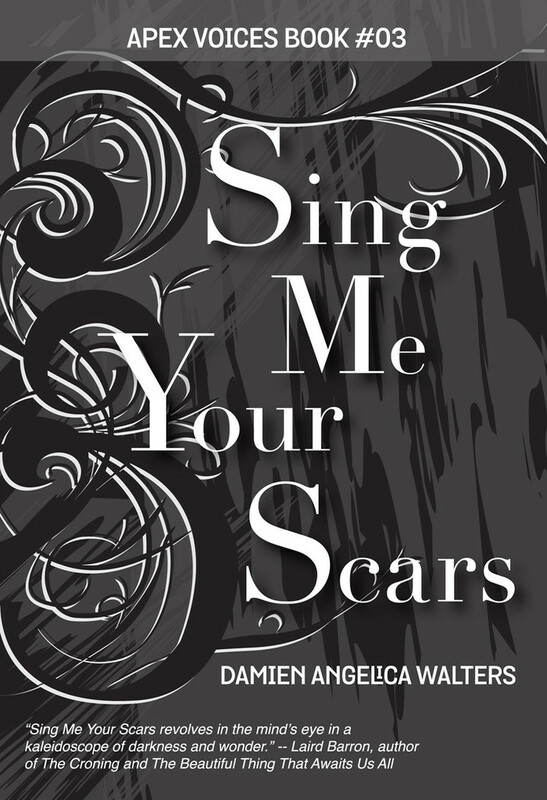 This is a collection of twenty stories written by the immensely talent Damien Angelica Walters. Twelve stories are works she’s already published and eight are brand new to this collection. And each of them tell stories that walk the world of horror and fantasy. I would love to outline each fascinating story, but in interest in keeping this review from novel length, I’ll choose three. Each favorite story from the book’s three parts. In the first part, I would say my most favorite (though I had several including the short story the anthology is named for “Sing Me Your Scars”), would be “All the Pieces We Leave Behind”. I felt that particular story truly spoke to me as it follows Meg, a bookshop owner and a person who is sensitive enough to feel the emotions that people leave behind in the things they touch. Meg becomes consumed by emotions of a particularly sinister stranger that leaves her warring with herself as she fights to find the calm and beauty she once knew. In part two, again I found it difficult to pick a favorite, but ultimately chose “Dysphonia in D Minor”. I adored this story as it tells the tale of two women lovers torn apart by duty. One sings a song of great beauty and through the Voice builds bridges, monuments, and whole buildings. But what happens when such a talent becomes corrupted, and two people once so in love find themselves worlds apart in the physical as well the emotional? And last but not least, part three. This time I didn’t have as much trouble picking a story simply because there was one particular tale that left me in tears (real honest to goodness tears). And that would be “Melancholia in Bloom”. This is a tale of a mother and daughter told from each person’s point of view. The mother is suffer from a devastating illness and the daughter is trying her best to cope. Little does the daughter know the secret of her mother’s old small wooden box and the power it holds. Man, it just gives me shivers writing about it.